Looking down on the play space, fountain and jogging path. Looking over walkway and jogging path. Looking through green space towards the main center. Cafe area overlooking the main hub. View from one of the upper walkways. Overlooking the upper running and walking path, with the arena in the distance. View from second level, looking towards kids’ play space. Setback view of kids play space from the second level. Ground level view of the playground. View of the pond amidst the green space. Public benches on the ground level. The main promenade with picnic tables and pond in the background. Central green area with public seating. Picnic table area looking towards cafe and business zone. 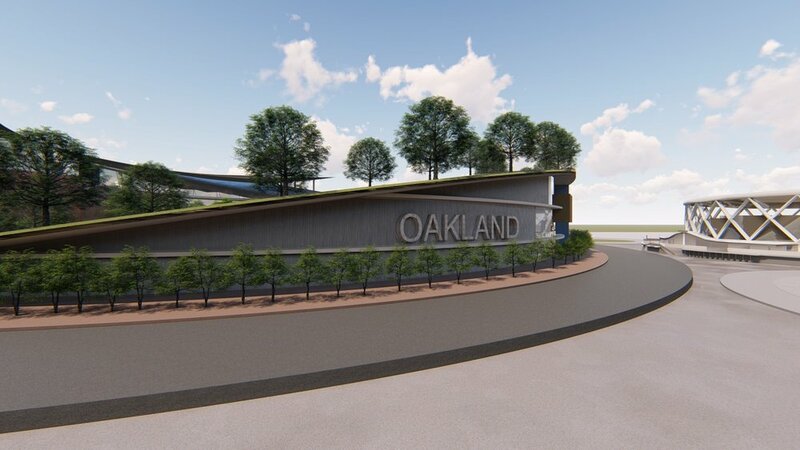 Exterior view of the reimagined Coliseum. Pedestrian BART pathway to and from the subway. Roadway next to the East Coliseum entrance. Topview plan of proposed Coliseum park complex. The Superbowl is on Sunday and we’ve got stadiums on the brain. Specifically, our local Oakland Coliseum, which will reach the end of its career as the home of the Oakland A’s and the Oakland Raiders, both of which are moving cities come next season. The future of the Coliseum has been a point of debate since the news of the moves broke. Should it be repurposed? Should it be demolished? Here at Yardzen, our primary aim is to help people get more out of their outdoor spaces, so naturally we gravitate toward a future for the Coliseum that enables locals to continue to enjoy the space in capacities beyond watching their team play. So we decided to have some fun with this and reimagine the Oakland Coliseum as a public space, with a jogging trail, a pond, a pet park, a coworking space, a play area for children and more. Transforming urban infrastructure into public parks gives cities like Oakland potential to offer a site for community and beautify the area. Repurposing this industrial area provides opportunity to enhance the quality of life for nearby residents. What do you think about the concept? Should the Oakland Coliseum become a public park? The wave of new electronic devices has left kids spending more time indoors than ever. Outdoor play is critical for children’s wellbeing, so it’s crucial to keep them in mind when designing your yards. For those living in or near a city, creating an outdoor space for your children can feel daunting. Whether you have minimal space or unique desires for your kids, the following will help you get the ball rolling with your project. Involve your child in the planning process. Get your children’s ideas for their ideal play space. While a rainbow rocket ship might not be attainable, they can certainly bring some needed imagination to the table. This space is for them after all. Incorporate nature. An outdoor space is an opportunity for you and your child to experience nature, so why not make this a focal point. Natural materials can look more attractive and help to integrate the play area with the native surroundings. Add in yard games. Yard games, like corn hole and horseshoes, are played in narrow strips of yard, and provide great entertainment for all ages. 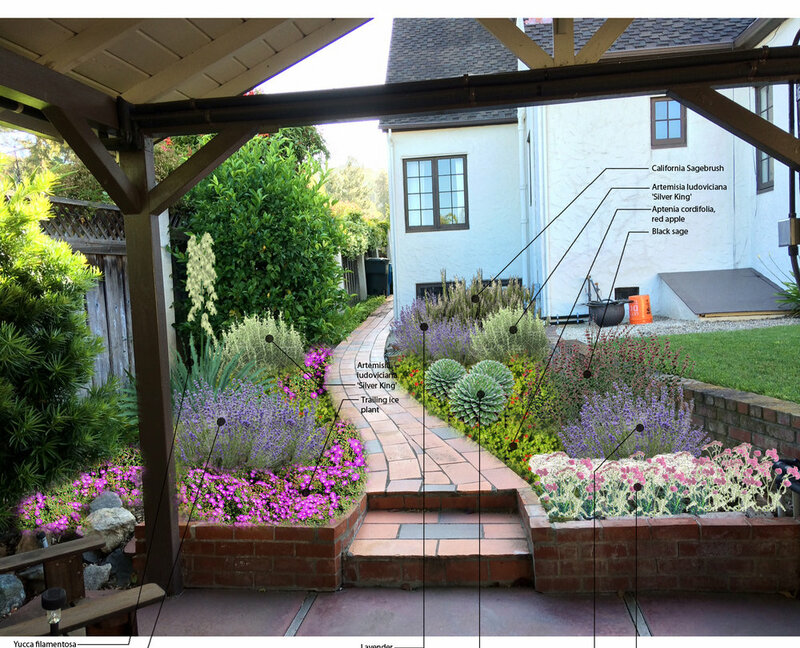 This could be an inventive solution to odd-shaped spaces or unused side yards. Use the vertical spaces when you’re trying to maximize usable area in your yard. Unique elements, like an outdoor chalkboard or dart board, are perfect options. They take up little to no room, and can provide hours of entertainment. Create multi-level play areas that fit into your space’s topography. Work with what you have, and in the end you’ll have an inventive space that fits in with the natural landscape. Multi-level areas can include features like slides and climbing walls. Include a gardening area. This is a great opportunity to introduce your children to new activities they can enjoy in your backyard. This activity doesn’t take up much space, and taking care of plants may curb their desire for a new pony. Unlikely, but worth a shot! Make space for active play. An empty area of hardscape or yard allows your child to evolve in their interests. Hardscape will be better for biking and skating, whereas grass can provide a cushion for more risky activities. Go low (water, that is) and get rewarded. Rebates are available from municipalities across the country for swapping in water-saving equipment and replacing your lawn with drought-tolerant plants. Check program guidelines before you jump in: Some require a site inspection before you buy anything or make changes. And you must be a resident and a utility customer to get rebates. With the Landscape Rebate Program, get rebates for front-yard and backyard ($250 each) conversion of grass to desert landscaping or for new desert landscaping installation. With the Landscape Rebate Program, receive rebates for irrigation controllers ($72), new landscaping that’s at least 50 percent drought-resistant ($200), and conversion of lawn to drought-tolerant landscape ($200–$600). The city’s landscape rebates provide as much as $750 for converting grass to low-water-use landscape. Search by zip code for incentives and rebates in your area. SoCal Water$mart offers rebates for weather-based irrigation controllers (from $80 per controller for an acre or less; $25 per irrigation station for larger sites), rotating sprinkler nozzles (from $4 per nozzle), and synthetic turf (from 30 cents per sq. ft.). Green Exchange Rebate Program has rebates for removing turf (50 cents per sq. ft.) and for improving the efficiency of irrigation. The Rainwater Harvesting Rebate Program gives rebates for storing rainwater (25 cents per gallon). The Water Conservation Check-up is a free on-site analysis of indoor and outdoor water use. With the Water Efficient Landscapes Rebate Program, get up to $350 in rebates for the removal of lawn or for the purchase of sprinkler equipment that improves efficiency. The 20-Gallon Challenge offers free landscape surveys and has rebates for weather-based irrigation controllers (from $230), synthetic turf (50 cents per sq. ft.), and rotating nozzles (up to $4 each). With WaterSmart Residential Landscape Program, get a credit with proof of purchase of drip irrigation parts and rotator sprinkler heads (50 percent of price), water-conserving landscaping plants and materials (25 percent of price), and permeable hardscape materials (up to $1 per sq. ft.). Rebates on efficient irrigation equipment and supplies (up to $350), through the Bay-Friendly Landscaping Rebate Program. Get rebates for water-conserving landscape changes (up to $1 per sq. ft.), through the Xeriscape Rebate Program. Aurora Water also offers free irrigation audits. Rebates available up to $200 for rain shutoff devices, irrigation heads with check valves, weather-based irrigation controllers, and matched precipitation sprinkler nozzles (which water more evenly and slowly than regular ones). Drip irrigation supplies, sprinkler controllers, low volume nozzles, and soil amendments have rebates. The Water Conservation Rebate Program gives rebates on buffalo grass (25 cents per sq. ft.), soil moisture sensors (up to $50), and drip irrigation systems (50 percent off purchase price, up to $50). Weather-based irrigation controllers (25 percent off price), rain sensors ($25–$50), and irrigation rotary nozzles ($5 per nozzle) get rebates. The Water Smart Landscapes program gives rebates for converting grass to desert landscaping (up to $1.50 per sq. ft.), for rain sensors (up to $25), and for smart irrigation controllers (up to $200). Rebate coupons offered for pool covers (up to $200). You can also get a free Indoor Water Audit and Retrofit Kit to test fixtures. Get money back on multi-setting sprinkler controllers (25 percent off), rotor heads for sprinklers ($2 per head), rain sensors ($25), and for rainwater harvesting (up to $150), through the Outdoor Rebate Program. EWEB customers can get cash rebates for certain types of timers for lawn irrigation ($25). Rebates for irrigation improvements (up to $150 for irrigation controller stations; 50 percent of hardware costs, up to $125) for nozzles, drip systems, etc., through Landscape Irrigation Product Rebates. Rebates (up to $375) for upgrading sprinkler systems or installing smart controllers are available. In its Irrigation Efficiency Program, Cascade offers rebates for rain sensors and weather-based irrigation controllers (up to $400 for existing irrigation systems; up to $375 for new systems). Landscape design in winter? Seems crazy. Well, actually crazy smart. Cold rain and wind typically don’t inspire people to think about outdoor patios and flowers. Usually, most people enjoy their outdoor spaces during the warmer months and their attention strays from their yards as the first rain and snow arrives. So you might be surprised to learn winter is actually a great time to kick start your outdoor space design. Yardzen is the brand-new way to design your outdoor spaces, all online. Starting with just your address and understanding of your lifestyle, taste and how you want to use your outdoor spaces, Yardzen designs the perfect yard for you without ever stepping foot in your yard. Then, should you choose, we connect you with vetted landscapers and contractors who can bring your design to life. Depending on your local climate, clients who start the Yardzen process in late fall and winter can choose to take advantage of all of the upsides of starting your design now, or go full force and get your plan installed, too. It allows ample time: Starting a design in late fall or winter allows you to take your time when creating your vision for a space. During spring and summer, there’s a rush to start and finish the design process quickly, which can lead to sacrificing key details. Since there’s plenty of time to design in winter before building begins in the spring, it’s best to have a set plan that you’re confident in. Any sort of home improvement can be stressful, so why not give yourself more time to breathe and create the design ahead of time? Pour over Pinterest, take a stroll through a nursery, drive around your neighborhood and assess what you like. See your outdoor space through winter’s lens: During late fall and winter the leaves fall from your trees and your garden is generally less sparse. This is a huge advantage in that you’ll see which spaces require hardy plants that will withstand the cold season and your design will be better informed, ultimately becoming a plan that looks good year-round. If you live in the western U.S. or any other location where the climate is moderate and snow is rare, getting your plants in the ground now has its perks. Here are a few reasons why winter’s also a great time to have your plan installed. Discounts! Due to the drop in demand for landscape services in the winter, there are frequent opportunities to save money. Landscaping projects have a rep for being quite pricey, however that doesn’t have to be the case. Contractors are much more liable to giving special discounts during the slower months, as are lots of nurseries and materials suppliers. Everyone has more availability: Regardless of where you live, you’ll get more attention from contractors in the winter. The demand for contractors is much lower in the cold weather, therefore it’s easiest to get on the priority list for pros before the actual building season. Beating the curve in the winter provides an opportunity to make sure you’re compatible with the contractor and that all of your goals will be met. See how your new landscape stands up to winter conditions: According to Pacific Outdoor Living, “observing your yard in the winter to see how it handles the rain, cold and foot traffic is a good idea and can even be an eye-opening experience.” You’ll see first-hand if there are any irrigation, drainage or runoff problems that need to be addressed. Rain instead of irrigation: The rainiest months of the year in most places are winter and spring, so why not let your plants soak up those nutrients and grow big and strong for summer? By treating them to a rainy season they’ll be more resilient to harsh, dry summer conditions. Get your Yardzen landscape design started today by completing your design profile. Editor’s note: Welcome to a new feature on the Yardzen blog where we interview a Yardzen Pro: a contractor in the Yardzen Pro Network helping to bring our clients’ Yardzen designs to life. We hope you enjoy it! And if you’re a contractor interested in joining the Pro Network, get in touch. YZ: How’d you find your way to lighting design? IR: It began with a need to use up-lighting for my art glass, a hobby of mine. I wanted to create a dramatic edge-lit effect. My father, who’s an architect, introduced me to all kinds of materials and glass constituted a large part of his architectural designs. I would hold up different colored samples of plate glass to the light and try and position it for the best light penetration and effect. I guess one might call it a natural progression, experimenting with translucent materials and light. YZ: What’s your favorite thing about your profession? IR: Definitely the problem solving that’s a fundamental part of the role. Every project involves problem solving. I’ve learned to allow myself space for it. YZ: . Tell me a story about a specific job that really stands out where lighting really made all the difference in the space. IR: It was a custom house in Mill Valley, CA with a steep-pitched, open-beam ceiling that was 25-feet high at the highest point. Compounding the problem was the fact that there were no walls separating the kitchen, dining and living room areas. After experimenting with many different types of fixtures, we used small high-tech projector lamps, the same type that are used in fine art galleries and museums. The projector lamps enabled us to change focal lengths so we could frame just a wall painting or just a seating area. At night it looked like a theater stage. We could manipulate the projector lens and create a very dramatic and mysterious look. The quality of light made everyone and everything look softly Illuminated. YZ: Why is lighting so important to outdoor space design? IR: I like to make my outdoor lighting designs serve as a welcome mat of sorts, so people can truly enjoy the beauty of the outdoor space. If it’s done correctly, outdoor lighting increases the living space. Example: put subtle up lights in the corners of your landscape’s parameter and your eye will automatically go to the farthest corner that has light. I call it “quiet lighting.” And in a project done well, quiet lighting should exist throughout the entire project. YZ: What trend in lighting design has you most excited right now? IR: Mobile technology. The ability to dim and control a single light in the garden using an app on your phone. It’s amazing! Each individual light bulb is controllable. About Yardzen: The brand new way to design your outdoor spaces, all online. Starting with just your address and an understanding of your lifestyle, taste and how you want to use your outdoor space, Yardzen designs the perfect yard for you without ever stepping foot on your property. Then, should you choose, Yardzen connects you with vetted landscapers and contractors who can bring your design to life. Learn more. Summer's upon us and now more than ever your kids will play outside. If you're like most parents who come to Yardzen to redesign their outdoor spaces, a cozy, creative playspace for your kids is at the top of your priority list. Here are some universal guidelines for choosing the perfect spot in your yard for your kids' dream playspace. To maximize use of your backyard and ensure you're left with room for the other elements you want — that gorgeous patio, the vegetable garden and the outdoor kitchen, to name a few — consider placing your playspace along the perimeter of your property. If you have a fence this serves the added bonus of providing a backdrop and, in effect, adding major coziness factor. There's nothing like a good climbing tree if you're a kid, and if you're lucky enough to have one or a few, particularly along a fence line, this is likely your playspace spot. Incorporate the tree(s) in your design and make it look like your playspace not only belongs there, but has always been there. You could create the most amazing playspace for your kids, but if you can't see them playing from a convenient vantage point, it just won't work. Especially if your kids are small you'll be dragging a chair to where you can watch, or constantly going back and forth to check on them. So why not choose a spot where you can easily watch them play. From a patio, from a kitchen window, from the living room. If it's not obvious work with your Yardzen designer to choose the best spot where you can keep an eye on them as they play. Maybe the slope of your yard is a thorn in your past design attempts, but here at Yardzen we say embrace it! Work with a hill to create a playground for your kids that you'd have loved yourself as a child. The possibilities for climbing walls and slides are limitless.